Smooth, intensely moisturizing and blissfully natural, this ultra indulgent oil from Earthly Body's Hemp Seed line was specifically created to inspire incredible hands-on touch. Silkily blended to moisturize, soften and intensely nourish skin as an incredible exotic scent fills the room, Massage & Body Oil effortlessly adds a slick, friction-free, professional glide to relaxing and sensual endeavors. 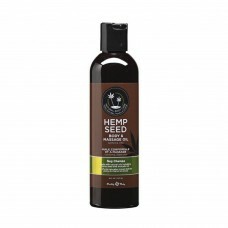 Assuredly vegan and absolutely cruelty free like all Earthly Body offerings, Hemp Seed Massage & Body Oil's formula is packed with completely natural ingredients, you'll be able to recognize each one- making up this non-greasy body treat is simple almond, apricot, grape seed, sesame and hemp seed oils combined with vitamin E, rosemary and a hint of fragrance. Containing absolutely no parabens or petroleum based additives, Massage & Body Oil is an indulgently natural choice, ideal for sensitive skin and body care purists. Completely cruelty free and 100% vegan lifestyle friendly.